Founded in London in 1992, Baumatic is recognised today as a major international kitchen appliance brand available in more than 40 countries worldwide. 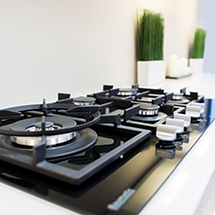 With a focus on modern European styling, premium features and providing value for money, Baumatic products are designed to offer you years of high-performance cooking in the hub of your home. Baumatic collections include Slimline, Pythagora and Studio Solari with technology-savvy appliances featuring ovens, cooktops, rangehoods, dishwashers, upright cookers, coffee machines and warming drawers. Baumatic leads the way in product innovation and design, highlighted with the introduction of the award-winning Blast Chiller oven, the first-ever for the Australian domestic market. Created for the health-conscious cook, the Blast Chiller has been developed to ensure home-cooked food can be stored at its optimum temperature for re-heating at a later date.